To make the pastry, in a food processor, whizz together the flour, baking powder, icing sugar and butter till the mixture resembles breadcrumbs, then add the lemon zest, egg yolks and milk and pulse until the dough begins to come together. Use immediately and do not allow to sit. Roll the pastry out to line the base and sides of a 20cm cake tin about 4-5cm high. To make the filling, in a bowl mix together the icing sugar, ground almonds, vanilla essence, lemon zest, whole eggs and egg whites together for 1-2 minutes. Add the cherries and almonds and fold in. Pour the filling into the pastry case. Bake in a preheated oven at 180°C/Gas Mark 4 for approximately 50-60 minutes. Remove from the oven and allow to cool completely. To make the almond covering, in a food processor whizz the sugar, almonds, lemon zest and vanilla essence together and blitz together for 1 minute. Add 4 egg white and pulse for a further 30 seconds till light and creamy. Check the consistency, if it is too stiff to pipe add in a little more egg white and pulse again. To remove the almond torte from the tin, lay a sheet of rice paper on a clean baking tray and place on the almond torte upside down. Spread a little of the almond mixture on top and flatten with a palette knife. Then place the remaining mixture into a piping bag fitted with a star nozzle and pipe all over, using any extra to make a nice design on top. Decorate with extra cherries and almonds. Put the torte back in the oven at 180°C/Gas Mark 4 for approximately 20-25 minutes or until golden. 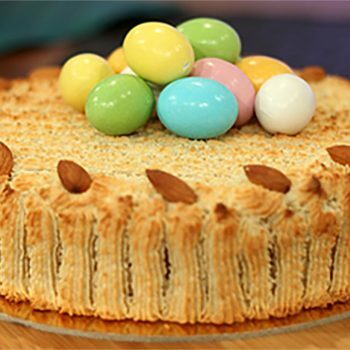 When cooled you can also decorate the torte with chocolate Easter eggs.